The high contrast lighting of the midday summer sun can terrible for many subjects. 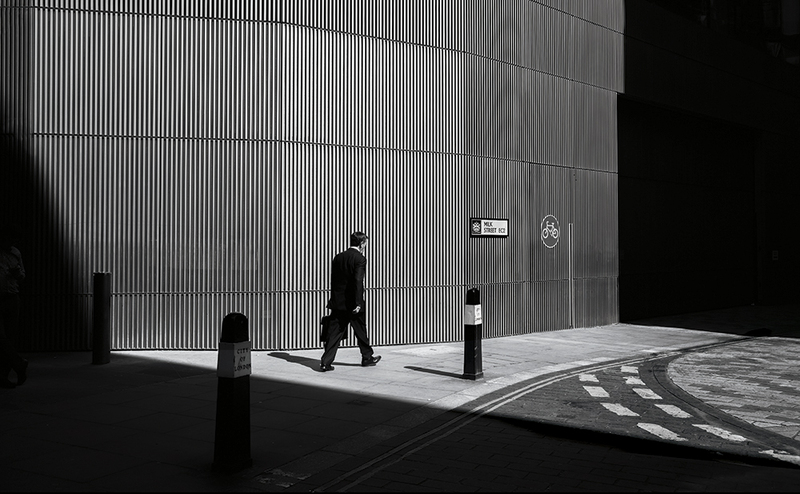 However, street photography can look fantastic when photographers play with these areas of dark and light. See our top tips for high contrast street photography. With any luck, at this time of year the sun should be making an appearance fairly frequently. However, the high contrast lighting you get in the midday sun is terrible for many subjects, and especially portraiture, due to bright highlights and dark shadows. This is because the camera can’t capture all the information between the light and dark areas. However, street photography can look fantastic when photographers play with these areas of dark and light. By focusing on simple form and composition, and allowing areas of the image to fall into complete black or white, you can achieve some striking street shots. Use an evaluative metering mode as a guide to exposure. Dial in exposure compensation to underexpose or overexpose the image, allowing for either completely black or white areas that’ll accentuate your subject. Great shadows with strong, powerful lines often come from large urban structures. Locations with tall buildings are often a good place to shoot, and it’s there you’ll find the best light as the sun peers past buildings. Focus on getting the basic composition just right, as this usually makes for the most striking play of dark and light. Images with lots of distracting elements can look cluttered and messy. If you’ve found some great light, set up a simple composition and metered it perfectly, then stake it out and wait. In the image above, it took around 15 minutes of waiting before the man with a briefcase walked by.